Merlin has perfomed with fire for over 10 years, either alone or as part of a tightly choreographed show. 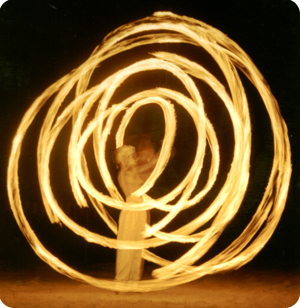 He specialises in Juggling and Swinging with fire. He has performed with fire in the desert in Dubai, for Jaguar, BCM and Pasha nightclubs in Majorca as well as many First Leisure and Rank nightclubs in the UK. Merlin also uses Laser Clubs and Programmable Glow Balls. These look incredible, creating patterns and trails in the air. They are completely safe for indoor use and are perfect for use where fire is unsuitable or space is limited.